Egg Muffins are an easy, simple breakfast option that are perfect to keep on hand for breakfast on those morning. 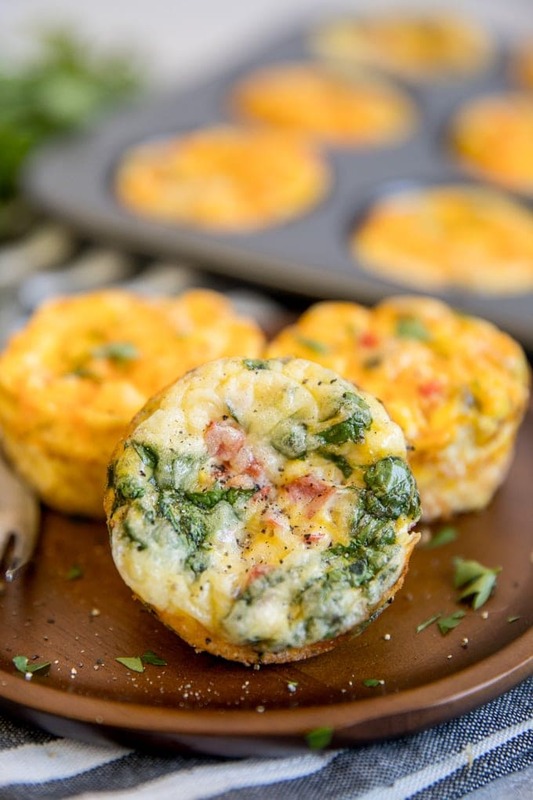 Full of protein and easy to customize, Egg Muffin Cups are a great grab and go breakfast or snack. These Egg Muffins are delicious on their own, but they are also part of a great weekend breakfast or brunch served with a Strawberry Banana Smoothie or some Easy Breakfast Potatoes! 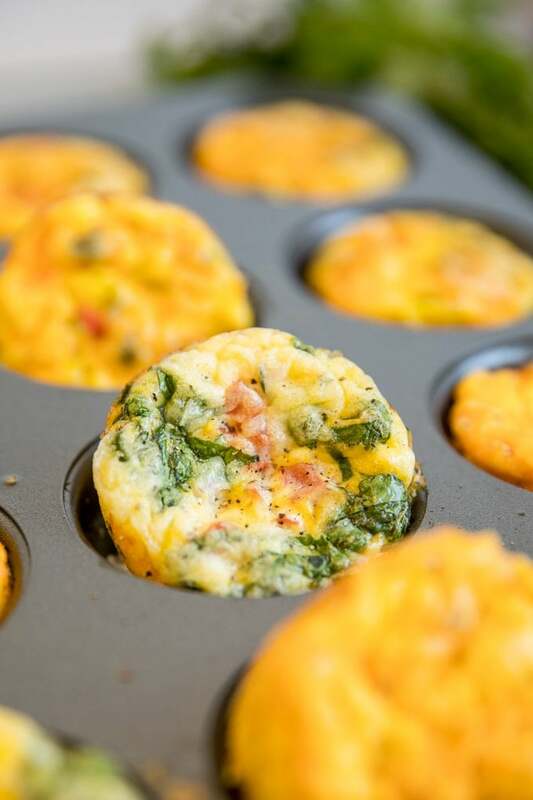 Say goodbye to morning struggles with easy to make, easy to customize Baked Egg Muffin Cups! Let’s face it, mornings with kids are hectic. It’s hard to get your kids to eat a healthy, filling breakfast while you’re urging them to get dressed, brush their teeth, brush their hair, finish their homework, feed the dog, and the list goes on and on. 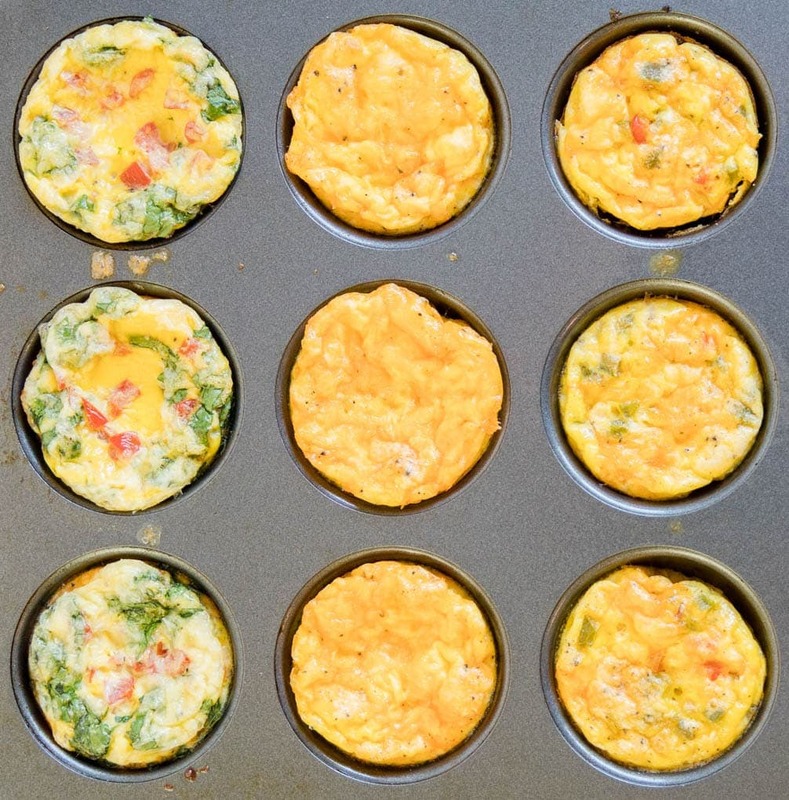 These delicious Egg Muffins are about to change all of that. Each muffin, before customizing, is just 50 calories each! Spray a 12-count muffin pan generously with nonstick cooking spray. If you have them, silicone baking cups are perfect for egg muffins. Whisk together eggs, milk and salt and pepper. Fill each muffin cup about 3/4 of the way full. Bake for 20 minutes or until eggs are fully cooked. If you insert a toothpick into the center of a muffin it should come out clean, and the eggs should start to pull away from the sides. The best thing about baked egg muffins is how easy they are to customize. You can prep the eggs, then decide on the mix-ins, even making them different for every member of your family depending on their personal tastes. Denver Omelette style (diced ham, onions, mushrooms, bell peppers and cheese). Keep in mind that the short baking time will not cook the vegetables or the meat. Saute vegetables in olive oil on the stove for several minutes or until soft and cook meats fully. 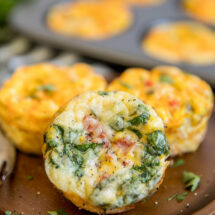 Keep your Baked Egg Muffins in the fridge for 3-4 days, layered in a sealed, airtight container. To freeze, wrap each egg muffin individually in wax paper and place in an airtight container. Freeze for up to 6 months. Remove the egg muffin from the fridge or freezer, wrap with a paper towel, then microwave at 50%. For refrigerated muffins, microwave for about 1 minute; for frozen, about 2 minutes. Keep in mind that times will vary based on the wattage of your microwave. Whisk eggs and milk together and season with a pinch of salt and pepper. Spray a 12-count muffin pan generously with cooking spray. Add veggies, meats and/or cheese to each cup as desired. * Pour egg into each cup, about ¾ full. Bake in the preheated oven for about 20 minutes or until eggs are fully cooked (a toothpick inserted in the center should come out clean). Cool slightly in the pan. To release, gently slide a thin knife around the edges of the egg muffin and pop it out. Store in a tightly sealed container for 2-3 days in the refrigerator, or up to 6 months in the freezer. (For freezing, it is recommended that you individually wrap each egg muffin so they don't stick together). To reheat: Wrap thawed egg muffin in a paper towel and heat on high for 30 seconds. From frozen, heat 1 and a half minutes. * If using vegetables, saute them in olive oil first to soften them. * Meats should be fully cooked before adding to your egg muffins.